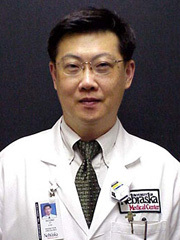 UNMC › Radiation Oncology › Faculty › Sicong Li, D.Sc. Optimization of beam orientation, weighting, and conformation. Radiobiological models of the biological equivalent doses. Accuracy in brachytherapy dose calculations with heterogeneity corrections. MRI guided planning and treatments. Optimization algorithms for inverse planning. Quality assurance of the treatment delivery. Treatment delivery efficiency and safety.